There was dissatisfaction with the dictionaries of the period, so in June 1746 a group of London booksellers contracted Johnson to write a dictionary for the sum of 1,500 guineas (£1,575), equivalent to about £220,000 in 2016. Johnson took nearly nine years to complete the work, although he had claimed he could finish it in three. Remarkably, he did so single-handedly, with only clerical assistance to copy out the illustrative quotations that he had marked in books. Johnson produced several revised editions during his life. In 1598 an Italian–English dictionary by John Florio was published. It was the first English dictionary to use quotations ("illustrations") to give meaning to the word; surprisingly, in none of these dictionaries so far were there any actual definitions of words. This was to change, to a small extent, in schoolmaster Robert Cawdrey's Table Alphabeticall, published in 1604. Though it contained only 2,449 words, and no word beginning with the letters W, X, or Y, this was the first monolingual English dictionary. "Writative – A word of Pope's, not to be imitated: "Increase of years makes men more talkative but less writative; to that degree I now write letters but of plain how d'ey's." "
The original goal was to publish the dictionary in two folio volumes: A–K and L–Z. But that soon proved unwieldy, unprofitable, and unrealistic. Subsequent printings ran to four volumes; even these formed a stack 10 inches (25.4 cm) tall, and weighed in at nearly 21 pounds (9.5 kg). In addition to the sheer physical heft of Johnson's dictionary, came the equally hefty price: £4/10/- (equivalent to approximately £631 in 2016). So discouraging was the price that by 1784, thirty years after the first edition was published, when the dictionary had by then run through five editions, only about 6,000 copies were in circulation—an average sale of 200 books a year for thirty years. The first was the 1755 Folio edition, which came in two large volumes on 15 April. The folio edition also features full literary quotes by those authors that Johnson quoted, such as Dryden and Shakespeare. It was followed a few weeks later by a second edition published in 165 weekly parts. The third edition was published in 1765, but it was the fourth, which came out in 1773 which included significant revisions by Johnson of the original work. 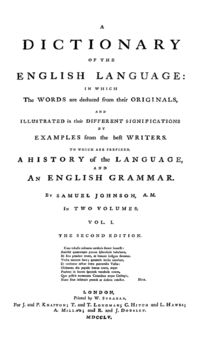 ↑ "A Dictionary of the English Language: A Digital Edition of the 1755 Classic by Samuel Johnson". Retrieved 21 November 2013. Lane, Margaret. Samuel Johnson & his World. New York: Harper & Row Publishers, 1975. 256 pp. Johnson, Samuel. Letters Ed. R. W. Chapman, London, 1952. Sledd, James H. and Kolb, Gwin J. Dr. Johnson's Dictionary. Chicago, 1955.